It's the mid-twentieth century and the Canadian lumber industry is dying. Only men who are strong in both body and spirit, men like Will Jameson, can lead the expeditions to harvest timber in the perilous mountain landscape. But when Will dies in a tragic accident, it falls to his younger brother, Owen, to take command. Recently returned from military duty, Owen watches his war-hero status quickly fade as he becomes entangled in a triangle between Reggie, the man he saved on the battlefield, and Reggie's wife Camellia, the woman he desires. As the town turns against him and the logging expedition becomes more treacherous, Owen seems trapped in a destiny full of betrayal, love, envy, and jealousy. 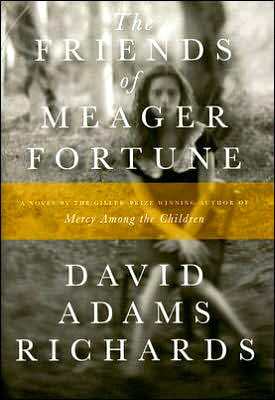 In The Friends of Meager Fortune, David Adams Richards returns to New Brunswick’s Miramichi Valley in the mid-twentieth century to explore gossip and betrayal in a small town that turns out to be just as treacherous as the Canadian lumber industry. It follows the Jameson family who own one of the last family-operated mills during the last days of the lumber industry - before it is taken over by mechanization and corporatization. After establishing the setting and characters in The Friends of Meager Fortune (and readers will note that Meager Fortune is a man, introduced on page 92), Richards follows two storylines of betrayal: the rumor and scandal circulating through the town; and the danger facing the men logging through the winter at the Good Friday cut. David Adams Richards uses historical settings to further the exploration of archetypal human emotions. It is to his credit that I, who have never really had any interest in the Canadian logging industry, was as totally engrossed in the story of the men working through the brutal winter as with the rumors circulating in the town. The Friends of Meager Fortune is mythical in its universal tale of fate. There are flawed heroes. There are far-reaching, terrible acts of betrayal. There are examples of human weakness. There are feats of superhuman strength. There is good among the evil. And, amidst all of this, there is a chorus of harpy-like townspeople, where rumor and gossip turn emotions and sentiments on a whim. Any one who has ever lived in a small town will understand how truly treacherous they can be, with public opinion easily swayed and quickly changing. I had to walk up the back way, through a wall of dark winter nettles, to see the ferocious old house from this vantage point. A black night and snow falling, the four turrets rising into the fleeing clouds above me. A house already ninety years old and with more history than most in town. His name was Will Jameson. In local legend the wife of Paul Francis was said to have the gift of prophecy when inspired by drink, and when Mary Jameson insisted her fortune be read with a pack of playing cards, she was told that her first-born would be a powerful man and have much respect – but his brother would be even greater, yet destroy the legacy by rashness, and the Jameson dynasty not go beyond that second boy.